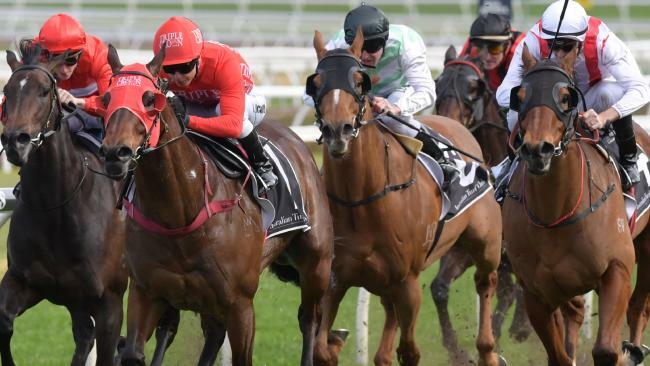 THE Everest champ Redzel isn't ready to climb down from the racing's highest mountain just yet. 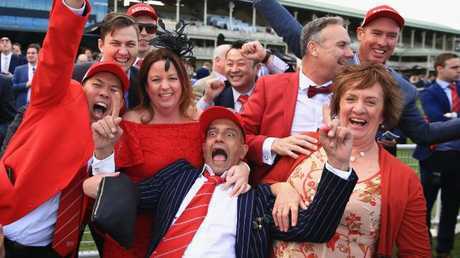 Redzel proved he remains the horse to beat in next month's $13 million The TAB Everest, making a brilliant return to racing at Royal Randwick on Saturday. Sydney's super sprinter was at his ruthless best with a comfortable comeback win in the Group 3 $160,000 Concorde Stakes (1000m). Redzel, shouldering 60.5kg, stopped the clock in a very fast 56.19sec, slightly faster than the 56.23s (carrying 60kg) he recorded winning the same race last year. 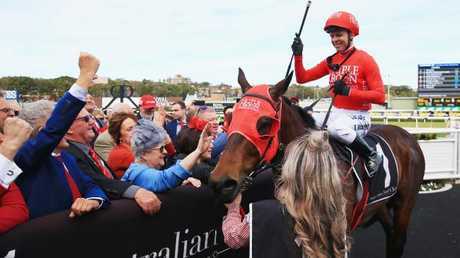 Trainer Peter Snowden believes Redzel is going as well this spring as he was 12 months ago when he won the inaugural The Everest. "I'm not going to say he is going better because he was pretty good last year,'' Snowden said. Redzel had an unbeaten four-race spring campaign that included wins in The Everest and Group 1 Darley Classic, but his star wasn't shining quite as brightly during autumn when he suffered three narrow losses in four starts. But regular jockey Kerrin McEvoy said Redzel made a statement with his dominant first-up win. "I would say Redzel is feeling just as good as ever,'' McEvoy said. "He had some close defeats last preparation and a few people jumped off him but he didn't lose me as an admirer. Redzel, who eased on track from $1.70 to start $2.30 favourite, sat outside the leader to the turn. He was then held together by McEvoy until inside the 200m before forging clear to score by one-and-a-quarter lengths from Kaepernick ($21), with Invincible Star ($2.35) a nose away third. McEvoy said Redzel had a high cruising speed and was always travelling well outside of Invincible Star. "As we were topping the rise, James (McDonald on Invincible Star) pressed the button on his mare and I was still cruising,'' McEvoy said. Snowden, who trains in partnership with his son, Paul, said McEvoy's patient riding was a deliberate tactic. "We were mindful of not giving Redzel too hard a run first-up, his main aim is six weeks away,'' Snowden said. Paul Snowden said it was "very satisfying" to see Redzel, who won his 13th race from 26 starts and took his career earnings over $8.8 million, return in such emphatic style. "I was watching the horse in the parade out the back and it's the first time I've seen him break a bit of a sweat pre-race,'' he said. "This shows he's to a bit left in the tank. The Snowdens are following the same race program with Redzel that worked so successfully last year and ultimately gave the sprinter an inaugural The Everest triumph. 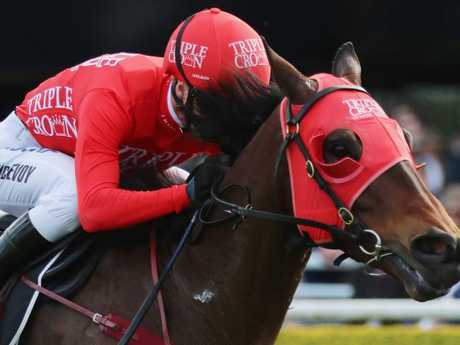 They have confirmed his next start in the Group 2 $200,000 The Shorts (1100m) at Randwick in two weeks, then it is three weeks into The Everest, the world's richest turf race. Redzel remains $5 second favourite on Ladbroke's fixed odds behind Trapeze Artist ($4.80) for The Everest, which will be run on October 13. Another Everest hopeful, Invincible Star, impressed jockey James McDonald with her brave first-up third. 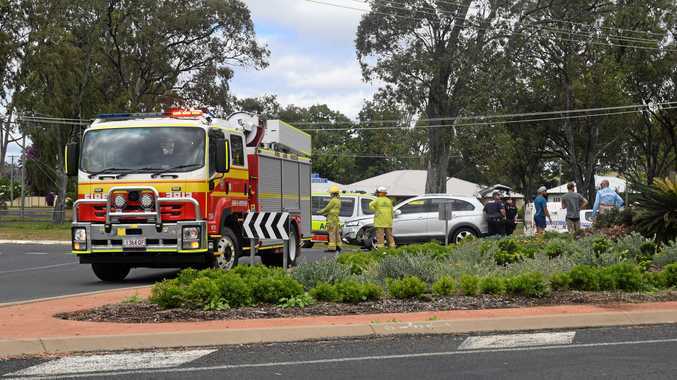 "She went brilliant,'' McDonald said. "She has had nine months off, was taking on the best sprinter, the reigning champion for the Everest and she paraded 'big'. "I'm certain six furlongs (1200m) will suit her because of the tempo, she'll be able to, obviously not get a soft lead in the Everest, but it will be a different tempo to having Redzel breathing down your neck and putting her to the sword. "She hasn't had that kind of racing for nine-10 months. She will improve a lot."